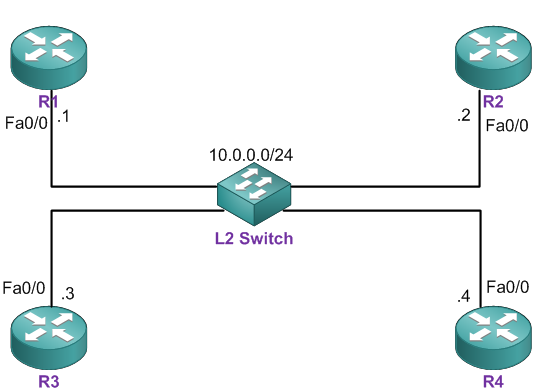 The beauty of this network type is the ability to multicast. Take the network below. If each router were to use unicast in the hello protocol, each one would have to send 3 lots of hellos every 10 seconds in order to establish & maintain adjacencies. Instead multicast allows the router to send 1 hello to do the same job. This best explained in the packet capture beneath. I’ve taken a packet capture on R3’s fa0/0 interface. The result is shown below. You can see that each router is only sending one hello, and it’s destined to 224.0.0.5. 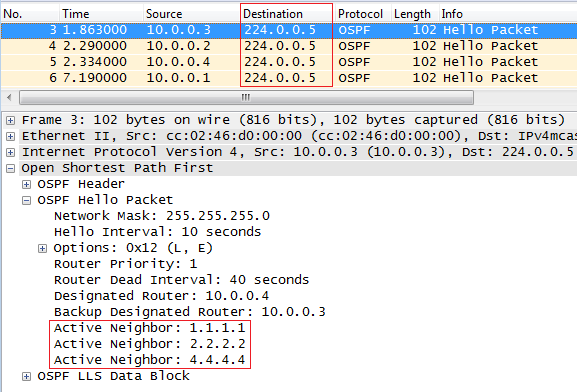 The highlighted line, which is a packet sent from 10.0.0.3 (R3), shows that R3 has active neighbors for routers 1.1.1.1, 2.2.2.2, and 4.4.4.4. So when any of those routers receive the hello, they are aware that R3 knows about them. For example, R1 can see that R3 knows about him because R3 lists 1.1.1.1 as an active neighbor. This shows how just 1 multicast packet can be used instead of 3 unicast hellos. As you can see the update was sent from R3 (10.0.0.3) to the DR only (224.0.0.6). 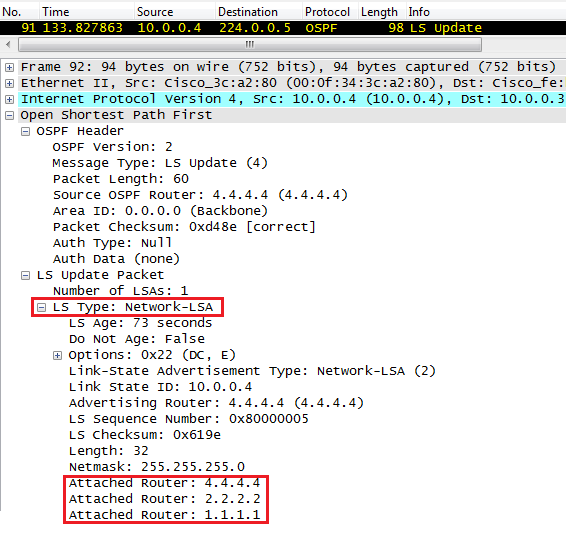 The DR (10.0.0.4 – R4) then sent the update to the AllSPFRouters address (224.0.0.5), and each router replied back to the DR with an LS Acknowledgement. So as long as each router is synchronized with the DR/BDR on the subnet, then they will be able to obtain all the information about the broadcast network.